Excel 2016 makes it easy to insert online graphic images into your worksheet. The Insert Pictures dialog box enables you to use Microsoft’s Bing search engine to search the entire web for images to use. If that’s not enough, you can also download images that you’ve saved in the cloud on your Windows OneDrive or your social media sites, such as Facebook or Flickr. Searching Office.com for clip art images of Tablet PCs in the Insert Pictures dialog box. If you use a social media site such as Facebook or the photo-sharing site Flickr on your Windows device, you can add these locations as options to your Insert Pictures dialog box. Simply select the app’s icon that appears at the bottom of the Insert Pictures dialog box to connect Office with the particular app. You can then insert images from one of these sites after selecting its option in the Insert Pictures dialog box. To download an image with Bing, open the Insert Pictures dialog box (Alt+NF), then click in the Search Bing text box where you type the keyword for the types of images you want to locate. After you press Enter or click the Search button (the magnifying glass icon), the Insert Pictures dialog box displays a scrollable list of thumbnails for images matching your keyword, as shown here. 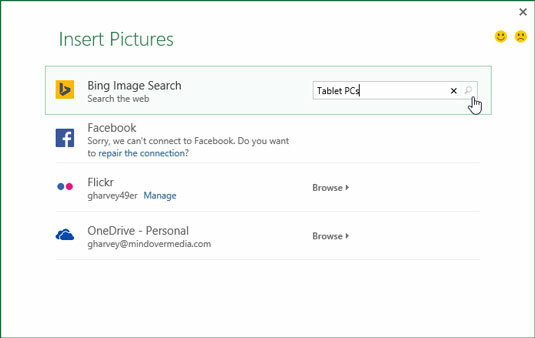 Selecting an image located with Bing Image Search to download into the current worksheet. 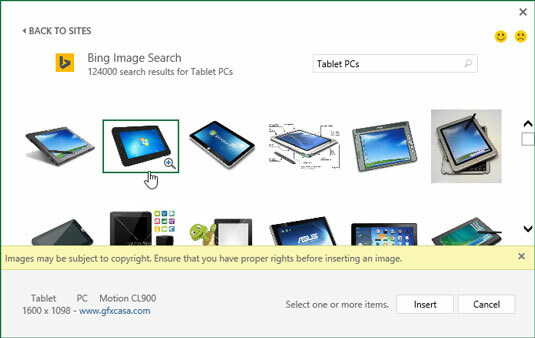 Below the initial row of thumbnails, the Insert Pictures dialog box also displays a disclaimer informing you that the online images that Bing has returned in the search use what’s called Creative Commons licensing that grants free distribution of what is otherwise copyrighted material under certain conditions (often noncommercial or educational use). The disclaimer then goes on to urge you to review the license for any image you insert into your worksheet so that you may be certain that you are in compliance with these conditions (always a good idea). After reading this disclaimer, you can close its text box by clicking its Close button with the x in it. You can then click a thumbnail in the list to display a short description plus the size (in pixels) of the image in the lower-left corner of the Insert Pictures dialog box as well as a hyperlink to the source web site (which you can use to visit this site to review the free use conditions of its Creative Commons license).